It is great when I get a second opportunity to work with clients because the relationship we build just gets easier and better with time. Julia had come in for maternity portraits as part of a training session for one of my students. Her and her son worked incredibly well during this exercise which, unlike private client sessions, tend to take longer and with less attention to themselves. Her little boy could not have been any better. His patience still astounds me. He did exactly what I wanted enabling me to produce this great portrait. I love the connection between these two and know that this will be a fantastic image to look back on in years to come. I mean, can you imagine what they will both think of this in 20 years time when they both look so different and Mum can no longer look down at her son. When Julia called to book in for the newborn session I was thrilled. And had no fear regarding Thomas and the likelihood of his co-operation. 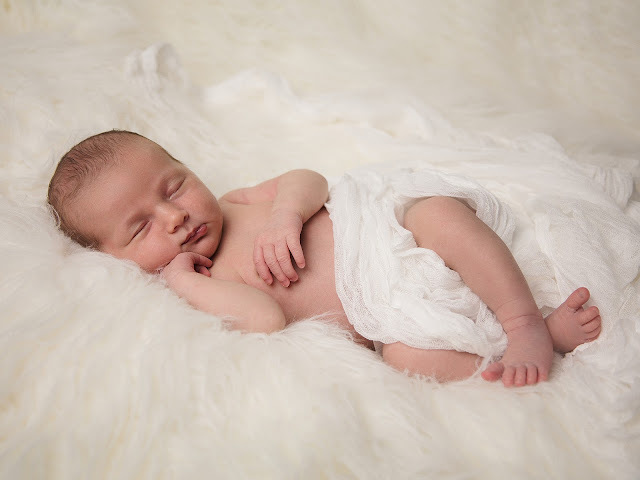 To make things easier for him though, since newborn sessions can be rather lengthy, we began the session while Thomas was still in school and made arrangements for him to arrive with us towards the end. I know he can be patient but I wasn't going to ask him to be that patient when it just wasn't necessary. 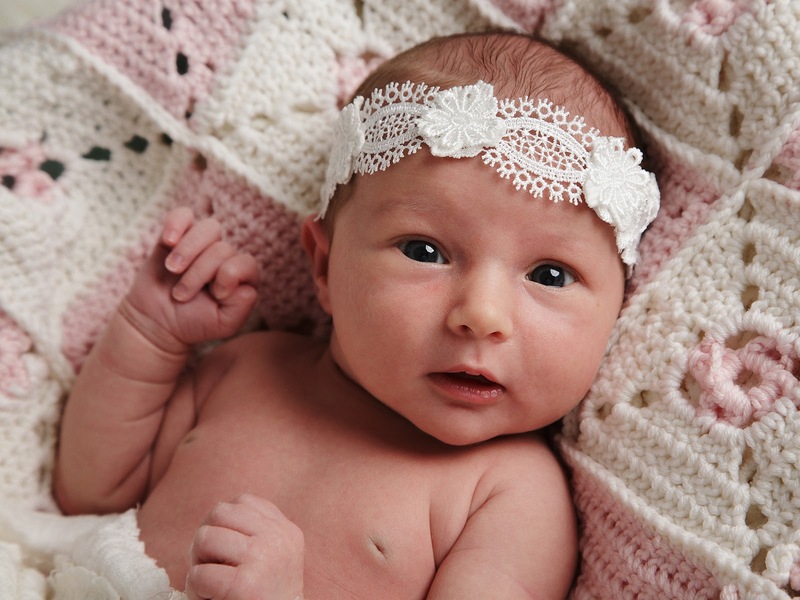 Before he arrived though we had a great opportunity to take many different images of Charlotte all on her own. As is sometimes the case, they don't always want to go to sleep during their session so we need to be patient and do what we can while they are awake. I always consider it a great bonus if I can get direct eye contact with a newborn which I was lucky to do with both the shot above and below. Again I got to use the cuddly toy and love this image for it too. This toy is really going to highlight just how much Charlotte is growing when they see its relative size shrink as she gets bigger. These little extras add value to the portraits and make them so much more interesting to look back on as time passes. 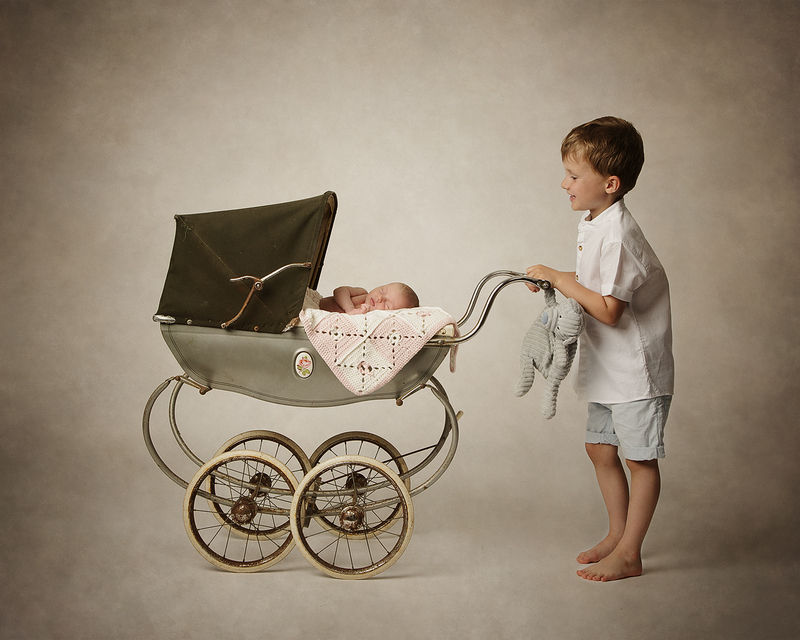 So if you are considering a portrait session try to bear this in mind and bring along anything that matters to you. 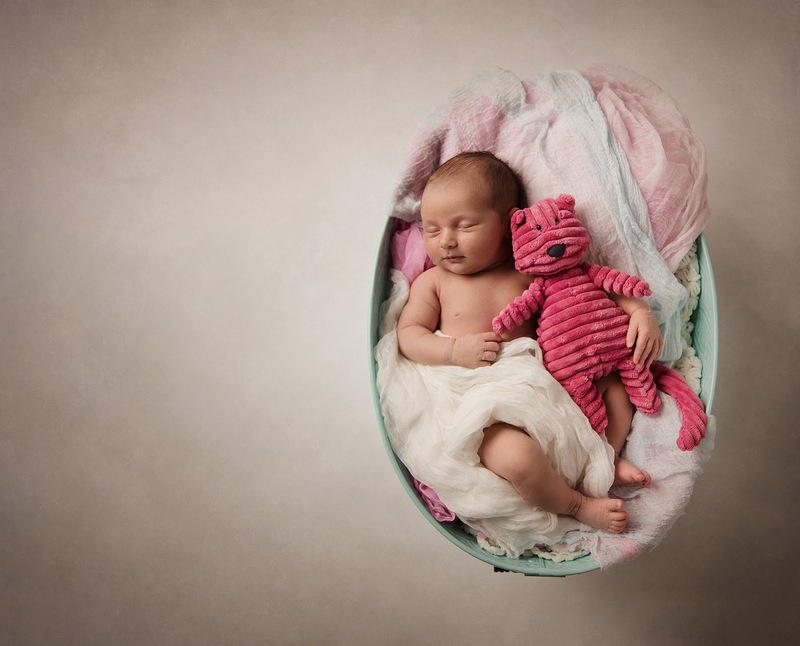 I also love a simple sleeping baby portrait. They spend so much time sleeping at this stage of their lives that I think its important to capture how sweet and peaceful they look. This stage certainly doesn't last long. And finally we have the weighing scales shot. 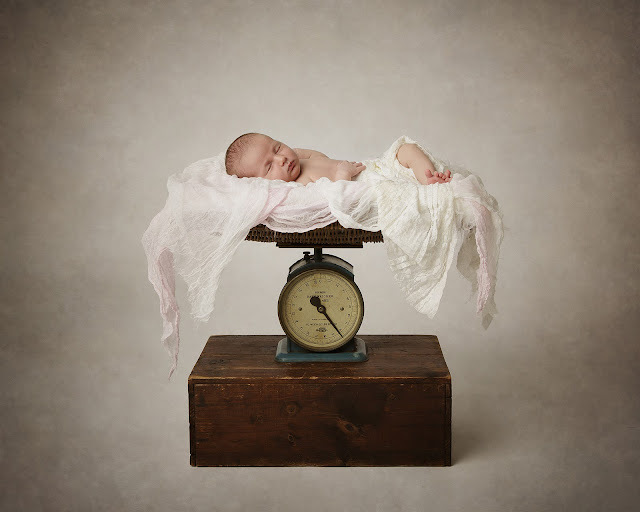 I still love this as it includes the babies weight at the time this portrait was taken. Again, a lovely keepsake. 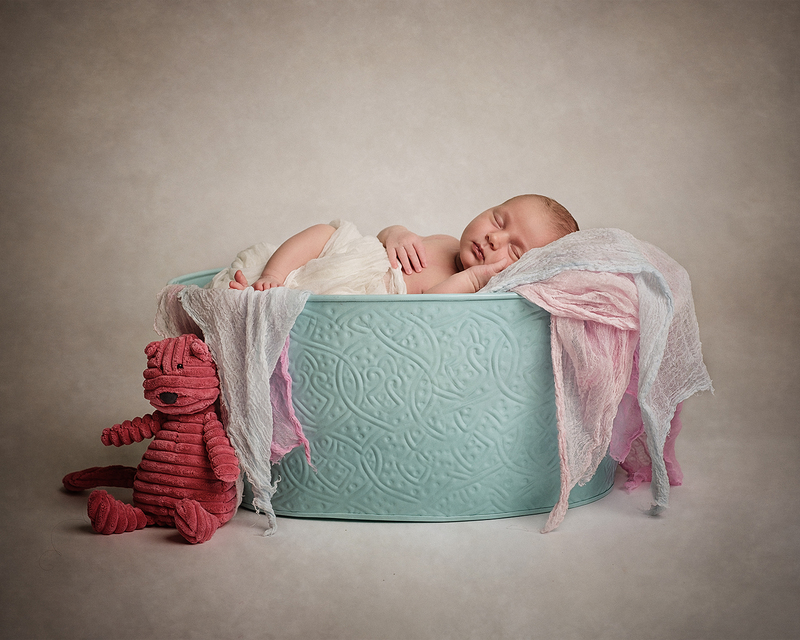 If you are considering newborn portraits the best time to do so is within the first 10 days. It is much easier at this time as they tend to sleep a lot so we have a much greater chance of a creating a variety of interesting portraits. 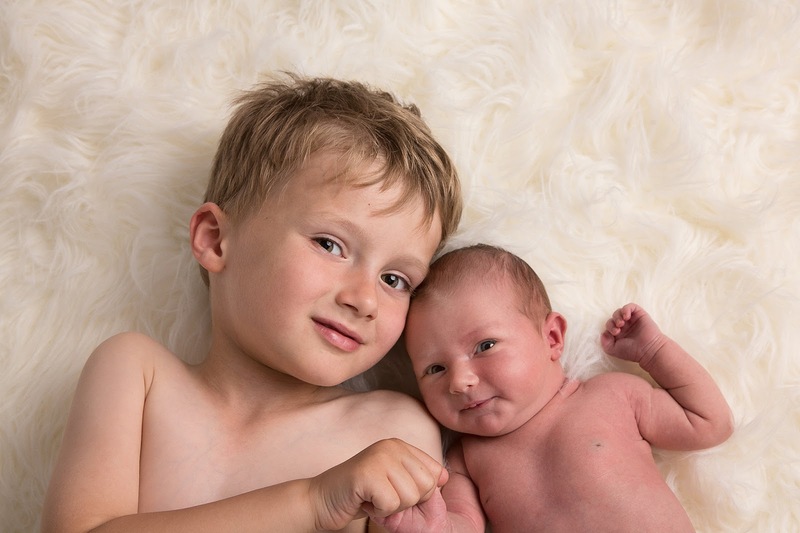 In order to guarantee that we have space for you it is best to get in touch while you are pregnant so we can hold space for you around the time that your baby is are due. You can get in touch by either ringing us on 01455 611069, following this link to our contact us page on our website, or sending us a message via our Facebook page here.